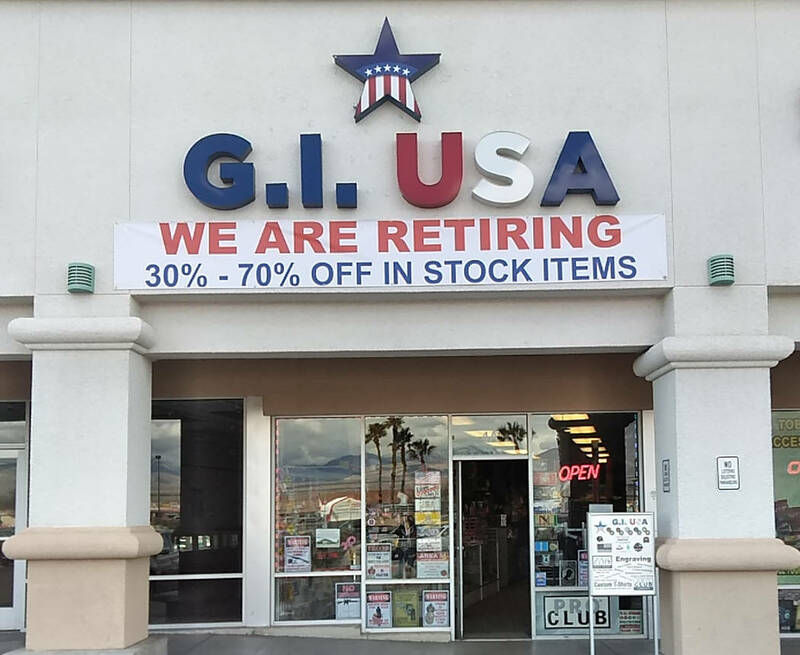 The owners of a Pahrump business, specializing in everything military are retiring. Selwyn Harris/Pahrump Valley Times After five years doing business in Pahrump, G.I. USA owners Cindi and George Vroenen are retiring. As such, merchandise in the store located at 150 S. Highway 160, has been marked down anywhere from 30-to-80 percent. The Vroenen's will remain residents of the Pahrump Valley. Selwyn Harris/Pahrump Valley Times Thousand's of items still remain on display at G.I. USA. Cindi Vroenen noted that several local business have agreed to purchase in bulk, what is not sold to customers, by May 31. Selwyn Harris/Pahrump Valley Times The Vroenen's said the landlord of the property was not willing to keep them at the same rent they've paid for the past five years. Recent health issues are another reason the couple, who will remain in Pahrump are retiring. George and Cindi Vroenen founded G.I. USA, located in the Albertsons Plaza more than five years ago, but it appears health concerns, along with other issues, forced them into retirement, according to Cindi Vroenen, who regularly displays a keen sense of humor. Health issues aside, Vroenen also spoke of economic concerns in relation to the business. “Our lease comes up in May, and the landlord is not willing to keep us at the same rent we’ve had for the last five years,” she said. “We are not the only business in this complex who is experiencing the same thing with the landlords, like us. It makes me sad to think about the owners of this property, because it seems like they just don’t care if the units are empty. Additionally, Vroenen said she and her husband are looking forward to spending more time with their family. At present, one of the Vroenens’ sons is a soldier stationed in the Middle East. “Once we recover from our medical issues, we will be visiting our grandkids that we don’t get to see very often,” Vroenen said. “My son is in Kabul, Afghanistan. He’s been there for almost a year and he comes home in May. I really want to see him because he’ll be home for only two months and then he goes back to Kabul for another year. A visit to G.I. USA this past week revealed the store still has much by way of merchandise in stock. Vroenen said she has a plan to clear out those items. Though the Vroenens will no longer have a typical storefront business, they will continue to perform their custom engraving work, and the like. Regarding the business’ loyal customers, Vroenen said all were a bit upset to hear that the store is closing. “When our customers learned that we are retiring and closing the store, they were very sad. 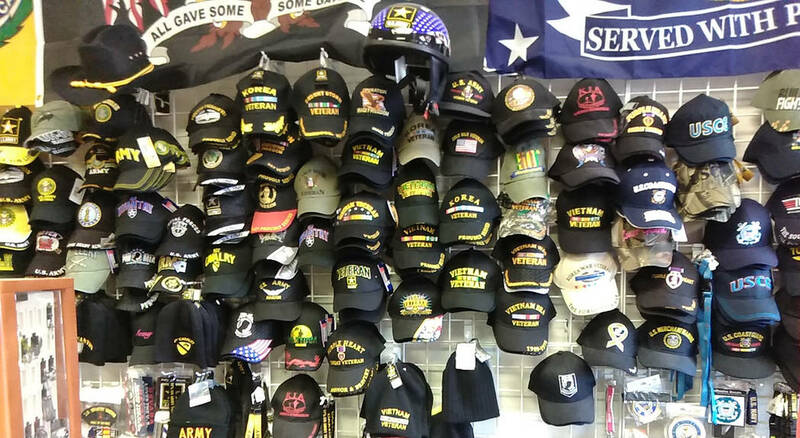 We’ve hosted many veteran and military-related events at our store over the years. We always observed Veterans Day, Memorial Day as well as September 11th. 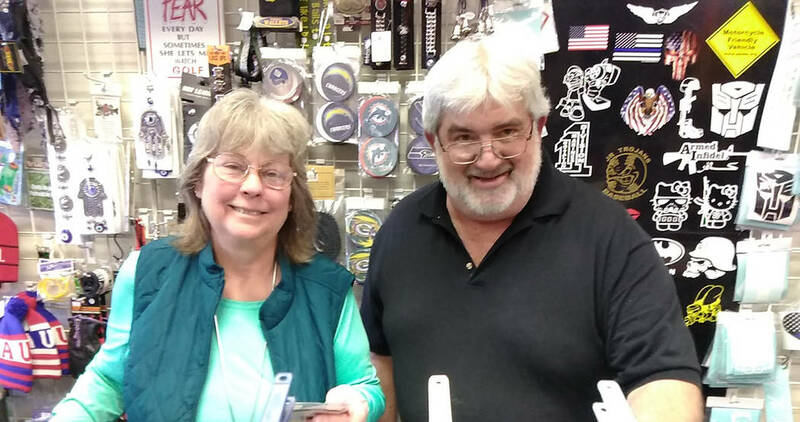 Eleven-year Pahrump residents Nick and Annette Salvato are loyal customers of G.I. USA as well as close friends of the Vroenens. Both lamented the closing of the business. The Vroenens’ final day in business is May 31, 2019. The business is at 150 S. Highway 160, unit 4-A. Hours are Tuesday through Friday 10 a.m. to 6 p.m. Saturday hours are 10 a.m. to 4 p.m. They can be reached at 775 513-7777.